A pack of 100 thin disposable polythene gloves (or 50 pairs). Will fit on either hand. Product description: A pack of 100 thin disposable polythene gloves (or 50 pairs). Will fit on either hand. 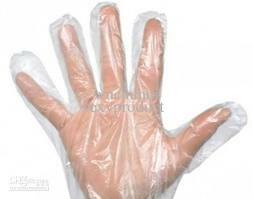 Description: "Picture of a clear disposable polythene glove"
Polythene Gloves. A pack of 100 thin disposable polythene gloves (or 50 pairs). Will fit on either hand.